Meg is Team Mom and Michael is coach of their twin sons' youth baseball team, the Caerphilly Eagles. Meg tangles with Biff Brown, the petty, vindictive league head. On opening day, Biff's lookalike brother is found dead in the porta-potty at the ball field. So many people think Biff's scum that it would be easy to blame him, but he has an alibi--and Meg suspects he may actually have been the intended victim. 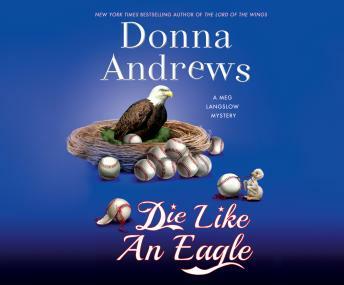 With Die Like an Eagle, readers can look forward to another zany Meg Langslow mystery--this one filled with the spirit of America's pastime and Donna's eagle eye.